Mutinhiri’s only became leader of the NPF last week after an abrupt resignation from ZANU-PF. In response, Zimbabwe’s new president Emmerson Mnangagwa said the government would be watching Mugabe’s activities very closely. ‘There is an issue regarding the former president,’ he said. 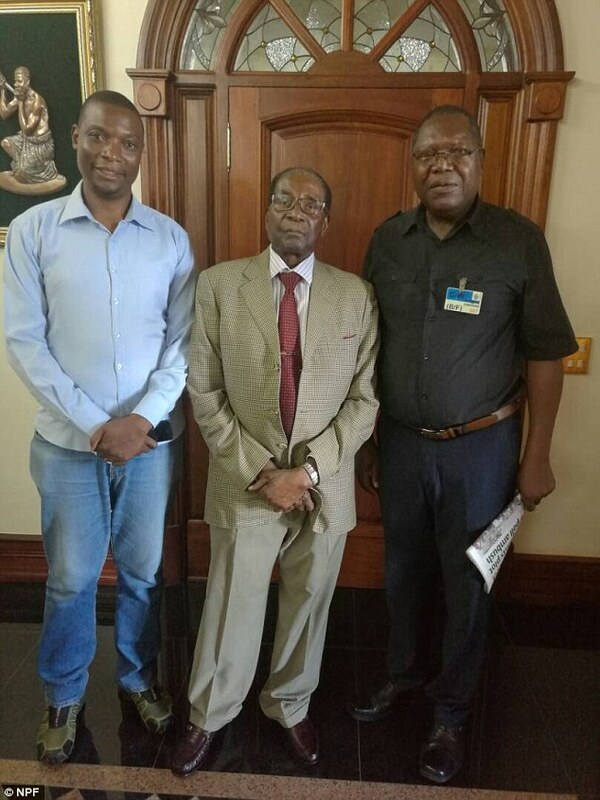 ‘(The photo) sort of solidifies the whole idea that the Mugabe family is behind the project,’ said Gideon Chitanga, an analyst with the Johannesburg-based regional think-tank Political Economy Southern Africa, describing Mugabe’s meeting with Mutinhiri as ‘very cordial’. ‘There is an understated panic — especially within ZANU-PF,’ said Zimbabwean political analyst Brian Kagoro who added that the ruling party had already struggled to formulate a response to the opposition following the death of its figurehead Morgan Tsvangirai in February. ‘It would have been a much easier task to concentrate on infiltrating the (opposition) but now they have to deal with uncertainty as to who is with them,’ said Brian Kagoro, a director of the UHAI Africa think-tank. The former first lady had cultivated her own factional support base within ZANU-PF known as ‘G-40’ that was seen as hostile to the security establishment. ‘There is a fight for legitimacy among the retired military supremos,’ said Kagoro, who suggested that Mugabe was behaving with ‘grand malice’ over his treatment. The NPF claims to have many members ‘who are outraged by the unconstitutional and humiliating manner in which president Mugabe was criminally ousted from the leadership of both ZANU-PF and the country’. Robert Mugabe was ousted in November 2017 after a 30 year career as President of Zimbabwe. Mugabe was instrumental in founding the Republic of Zimbabwe – but became known for his brutal policy and corrupt leadership. His rule proved to be one of the most controversial of any world leader in the 20th or 21st century. At 94 years of age when he was eventually replaced by a military coup he was by far the world’s oldest active national leader. He was deposed by a military uprising but refused to resign from office for several days afterwards – prompting days of protests across Zimbabwe. Eventually he was persuaded to resign and he was replaced in his position as President and leder of Zimbabwe’s ruling Zanu-PF party by Emmerson Mnangagwa – known as ‘the crocodile’. ‘They are trying to create the impression that Mugabe has a lot of residual support,’ said Derek Matyszak, a independent Zimbabwean political analyst. ‘But I don’t think they are going anywhere. ‘The normal thing would have been for him to retire quietly,’ he said. The NPF has quoted Mugabe as saying that ‘people are free to belong to parties of their choice’. It also vowed to ensure ‘there is no interference by the army, or those that would want to resort to violence as a means of getting votes’.